A Veggie Venture is hardly known for 'haute cuisine'. But some time in the last few months, I recognized -- then accepted, soon relished -- that my food style is that of a home cook, a curious home cook perhaps, a Midwestern home cook likely, but always, a home cook. And it makes me realize that even when we're curious about new foods, actively seeking out new recipes, new cuisines, even when we stretch ourselves with new ingredients and new flavor profiles, even when we tackle something harder (or sublimely authentic) than we have before, we still have our own comfortable spaces, the ones we return to most often, the ones that define the kind of cooks we are. And finally! With no further ado, I proudly present the home-iest (and perhaps homely-est) of home foods, fried potatoes and cabbage -- and share that taste-wise, especially with a liberal dose of ketchup, it sent the table over the moon. The British call this "bubble and squeak" and there are no fewer than 41 "recipes" for it at Cooks.com, each one different, and none on the major food magazines. THAT speaks volumes. The one requirement is potatoes, often mashed, with any luck leftover. Cabbage is next on the ingredient list though some variations add or substitute other vegetables. Many include Sunday's leftover roast -- as did mine, ham. And then it's all cooked up in a skillet. If you add lots of fat, you'll get a heavenly crust -- since I can't bear to use that much fat, next time I'll see if (1) a non-stick skillet helps, also (2) a skillet placed on top and weighted with a couple of big cans of tomatoes. The bottom line is, if you're a home cook, this belongs in the repertoire, hmm, too fancy a word? yes, a place on the menu. It's easy to overdo the starch here, I used a 1:1 ratio of potato:cabbage and would go so far as 1:2. This is a great way to use up leftover ham or leftover corned beef but meatless would be great, too. Potatoes and cabbage are the stars. Does ketchup qualify as garnish? I do believe! FROM THE ARCHIVES The Recipe Box has plenty of potato recipes. Sorta-kinda similar are the potato okra curry and the warm potato salad. Bring the salted water to a boil. Add the potatoes as they're prepped, the cabbage on top. Cover and let cook til potatoes are done. Remove cabbage wedges and chop. Drain potatoes. In a large skillet, heat the oil til shimmery. Add the onion and cook til just beginning to brown. Add the cooked potatoes, cabbage and ham and stir to distribute. With a fork or spatula, mash the potatoes a bit, then press mixture into the pan to form a large 'pancake'. Let cook til edges brown or mixture is heated through. Transfer to serving plates, drizzle elegantly with ketchup, serve and enjoy. A woman in one of my cooking groups told me once that she aspired to be a gourmet cook. I laughed, too, for I knew in my heart that I never aspired to be that. I hope to be a good home cook, and to share that love of good home cooking with others. I always tell people that I am the worst food "stylist" in the world; my food always tastes pretty good, but doesn't look particularly fancy. I guess that's what I aspire to! I think my cooking identity is somewhere in the middle between "gourmet" and "home cook." I'm not into fussy recipes with tons of steps and lots of ingredients, but on the other hand I really prefer highly-seasoned food with unusual combinations of ingredients. But then I also love to make simple soups, stews, roasted veggies, and grilled chicken as much as anything. I know my friends and family consider me a total gourmet cook, and I laugh when I think of some of the truly gourmet recipes I see and how they would react to them. I guess on a scale of one to ten, I'm at least a seven towards the "home cook" end of the scale. And to second what Lydia said, I must also be one of the worst food stylists there are, and not particularly interested in it; I like photos that show how the food looks, but I don't have much imagination in using accessories or creating a place setting. I think it's good that those of us with similar cooking styles can find each other now and share recipes! And every once in a while one of those more "gourmet" types can entice us to get out of our comfort zone too. Well, I´m 60+ something and have experienced a "food revolution" in Swedish food culture the last twenty years, thanks to our immigrants. In the early 60s I only cooked what my mother had taught me; that is old Swedish home cooking. Now, I spend many hours/week reading food blogs, watching BBC Food, reading food magazines and so on... always looking for inspiration to serve something new. However, I haven´t forgotten those old recipes of old fashioned Swedish food. My husband prefers such food. My children and grandchildren, though, appreciate the changes. That's funny. I think about that sometimes too but what I came up with to label myself with is to not label myself. I think there's a time and a place for every style of cooking, that neither "home cook" nor "gourmet" is derogatory or flattering, they're just descriptions. I may flater myself, but I feel like I hop and skip in between "down home" and "high falutin'" with abandon. Love the Bubble and Squeak recipe. I had no idea what that term referred to. Nothing much better than potatoes and cabbage--yum! 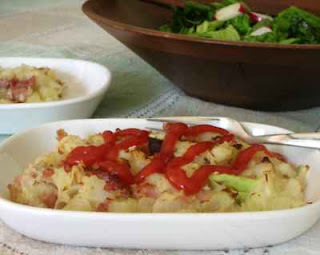 Loved the bubble & squeak my Gran used to make for Sunday supper! I don't really aspire to be something related to cooking. For me, the cooking is all about discovering, learning, and expressing. The blog combines that with writing and photography and a social scene that I love. That said, I love to learn new things and I definitely have a beginners mind related to cooking. 1- Hurrah for curious, enthusiastic home cooks! 2- I nominate Bubble & Squeak for the best food name ever! Lydia ~ 'Simple food cooked well' are my watchwords. But I love that food blogging has expanded my definition of those boundaries. Kalyn ~ Interesting! That's a side of you that doesn't come out on Kalyn's Kitchen!! Karin ~ Good point, how the very definition of "home cooking" changes over time, with the generations. It also helps me understand why my mother thought of my style of cooking as 'gourmet' and I remember looking at her thinking, what? this?? gourmet??? Glenna ~ Like the blue jeans / fancy pants gown hopping and skipping! I LIKE that, thank you! Maybe I should be thinking of those 'boundaries' as stiles to the other side once in awhile! Aii Catherine ~ I bet your Gran loved that you loved her bubble & squeak! Stephen ~ Hoorah, for sure! I second the motion! Ah yes, that recipe would work, thanks for the link! My mum used to make us bubble and squeak when I was little (and still lived in England). I love it. Our local food co-op has what it calls bubble and squeak -- sausage with alfredo sauce poured over the top, I think there's cabbage in it too. I don't know who came up with that idea. I love to make bubble and squeak with leftovers, and I really like it to be a bit crisp on the outside. One of the ways I get that to work without using so much fat is to cook in a cast iron skillet. I mix up the cabbage and potato and smoosh it into the pan (with some fat) then let it fry while heating the broiler. Then I stick it under the broiler 'til the top gets browned. I like mine with a fried egg on top. Bacon also goes well. Iris & Angry ~ Thanks for joining the conversation! I love that what's essentially 'leftovers' is so embedded in the food canon, also that there are 'proper' versions. I really appreciate your describing what the pleasures of bubble & squeak - thank you!! OK so I know this is a late entry, but Ive been mashing potatoes with cabbage recently and I love it. Its my lazy version of the Irish Colcannon. I cant wait to try this. I kept thinking to myself that I loved potatoes and cabbage together cause of my partial Irish roots. I am so happy to have found this.